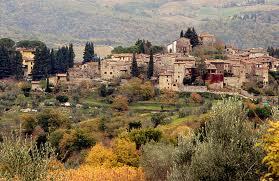 SARONNO, Italy - Today's recipe for Tuscan pot roast calls for wine from the Chianti area in Tuscany, wine country. Some of the best wines in the world come from this region which extends over the provinces of Florence and Siena, covering the area between the two cities and beyond, going toward Arezzo, Pistoia and Montepulciano. 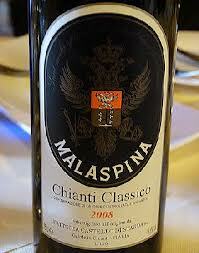 There are all kinds of Chianti wine, regular Chianti, Chianti Classico and the top of the line, Chianti Riserva. 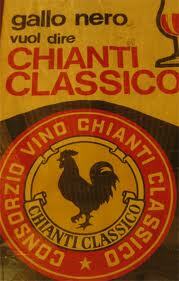 If there is a black rooster on the label, that is your guarantee that what you are drinking is true Chianti and not another type of Chianti-like wine that some unscrupulous wine producer is trying to pawn off as Chianti. 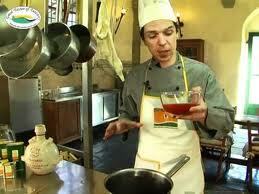 Not to say that there are unscrupulous wine producers in Italy – wink, wink. You know how particular Italians are about their food and drink, their number one worry when they travel is what they are going to eat, seriously, so it was a natural progression from regular Chianti to Chianti Classico to Chianti Classico DOCG as Chianti progressed from an everyday table wine to the super star category. (For an explanation of the designations see Aunti Pasta: PDO, DOP et al February 4, 2010 http://thisitalianlife.blogspot.it/2010/02/auntie-pasta-pdo-dop-et-al.html). 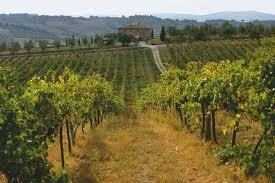 The first upgrade came when Chianti no longer used grapes that were not grown in Chianti. That is what the DOC, Denominazione di Origine Controllata means, the grapes used to make the wine in that bottle really came from the Chianti area. Then they began producing Chianti Classico, which qualified for the DOCG designation, the DOC for the control of the origin of the grapes, with an added G for Garantita, guaranteed. So now, the grapes that make Chianti Classico were not only checked to make sure they were actually from Chianti, it was guaranteed that they did. And that is still true. Not to get wonky but the rules and regulations wine has to adhere to in order to carry the DOCG designation are lengthy, to say the least. Forget any ideas you might have had about dark eyed beauties stomping grapes in the sunshine, the wine industry in Italy has more rules, regulations and controls than a NASA launch. For the Chianti Classico they include the percentage of Sangiovese grapes used in relationship to the amount of Canaiolo and Colorino grapes, and while Trebbiano and Malvasia grapes were once allowed, under the DOCG rule they were out. 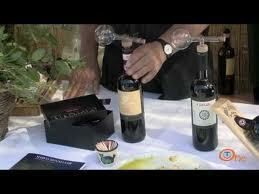 The list of rules and regulations actually goes on ….. and on…… and on…….right up to just before the wine is bottled. That is when it must undergo a final chemical exam to insure it meets all the requirements, and also pass a final ‘tasting’ test. The rules say that the wine has to be bright ruby red color tending to garnet; it must have a grapey odor with a scent of violets that is more pronounced if the wine has been aged; and it must be dry with a pleasant, slightly tanic taste that finishes to a velvety softness, their words, not mine. I hope I can remember those lines the next time I’m served a Chianta Classica. I’d love to be able to say, “oh my, this wine has a wonderful ruby red color bordering on garnet with such a delicious taste, is that a hint of violets I detect? And what a wonderful velvety finish, don’t you agree?” I might find myself tossed out on my backside, but it would be fun. While I wait for my perfect opportunity I think I’ll whip up a little Tuscan pot roast. 2, Once the wine has evaporated, add the tomato purée; cook slowly for 3 – 4 hours, adding a little meat stock if the tomato puree becomes too thick. Once cooked, take the meat out of the pan, let it sit for at least 10 minutes, remove the string and slice it; reduce the cooking juices and pour the piping hot sauce over the meat slices. Serve with polenta or mashed potatoes. 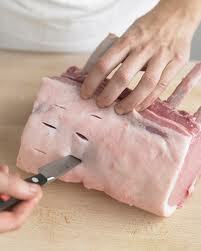 With a sharp kitchen knife make several incisions on the surface of the meat. 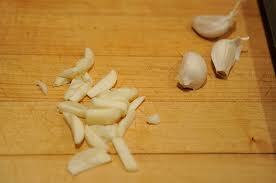 Insert a sliver of garlic into each incision. There are other ways to lard meat, more complicated and complete, but right now I hear a bottle of Chianti calling me, so I'll save the larding talk for another day.